Need some uplifting advice? Certified life coach and Mill Valley resident Francois Levannier has come up with the My Oracle iPhone app ($2.99), designed to reveal what you can do to positively influence your current situation. Levannier says that with the app turned on, you simply ask a question in a way that would invoke your ability to act in the situation, such as, “What do I need to pay attention to at this time in my life?” and then wait for the Oracle’s motivating response. It took almost six months from design process to final project and the actual grocery store isn’t open yet, but the downtown Novato Whole Foods’ murals are ready for the community to enjoy, thanks to lead artist Peri Pfenninger and assisting artist Sharolyn Poli. The new Serena & Lily World Repair Kit is the ultimate guide, packed with activities to get kids inspired to change the world. January marks the start of the karate tournament season and Mill Valley’s Yasmine Bakhtiari is training hard to keep her BASKA (Bay Area Sport Karate Association) Championship title. Bakhtiari followed her two older brothers into the sport as a toddler and now out-competes both of them. “A lot of kids will get their black belt and quit the sport,” says her mom, Leigh, who also competes in the sport. “Yasmine has stuck with it and it has been so good for her in so many ways.” The entire Bakhtiari family trains at Taylor’s House of Karate in San Rafael, where Yasmine donates her time to train kids from all over the county for free. Regarding keeping her belt title next year? According to Tony Kattengell president of BASKA, she is a dynamic competitor and a great role model for young girls, and as far as keeping her championship title goes, her fiercest competition might be coming from her own family. In the same championship tournament last fall, her sister Shayda, age 10, earned third place in Kata (forms), and her youngest sister, Leila, age 8, took first overall in her age group. For those inclined to make reservations instead of a mess in their kitchen, here are some group-tested recommendations from our Facebook friends. We asked for a favorite private room, round table or gathering spot in Marin. Alicia Brooke Gray: Buckeye for a big round table. Marinitas for a fun, festive long table. And then Picco or Lark Creek Tavern for intimate private rooms. 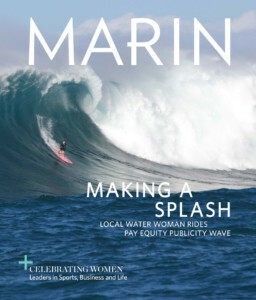 Stephanie Kerry: Marin Joe’s! We have been celebrating family moments at Marin Joe’s since I was little. I remember waiting for our table in the lounge drinking a Shirley Temple and making cheese and cracker snacks. As far as seating, the whole restaurant has that Italian family atmosphere. Very festive and boisterous. Neslee Punzalanoh: Special occasions family…we always go to Robata’s Grill in Mill Valley. Carissa Remitz: The Tavern at Lark Creek has a fantastic marble-topped communal table in the center of the dining room, perfect for family dinners. They also have great private dining spaces in the sun room and upstairs.